NEW YORK—Brendan Johnston likes to keep his artistic choices open and varied, yet steady. The young artist has calibrated his internal compass to keep him on course in the artistic tradition of the old masters, and yet he’s perfectly at ease with not knowing yet exactly how he wants to distinguish himself. His confidence rests in the search, in little discoveries, in that stirring process of refinement toward mastery. As a child he had a deep desire to become a fine artist, but it took some time for him to find the place where he could fully dedicate himself. 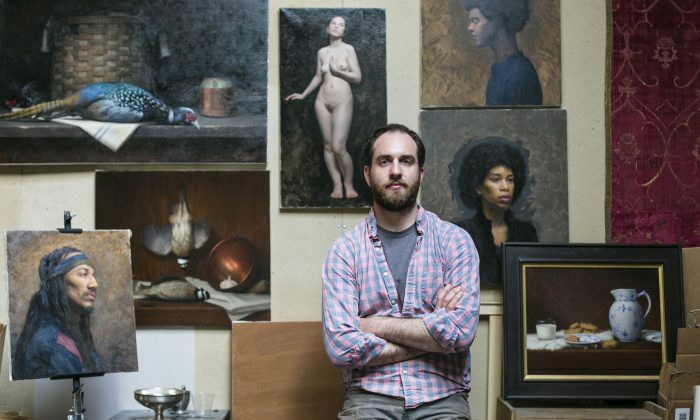 After earning his degree in art history at McGill University in Montreal, he tried several fine art schools for short stints—with differing degrees of satisfaction or dissatisfaction. Through a friend of his father’s, he met an alumnus of the Florence Academy of Art, Andrea J. Smith. She taught him cast drawing and introduced him to the atelier art world, when she was running The Harlem Studio of Art. “She helped me to train my eye very well. She was really rigorous in getting you to see differences, to replicate values,” Johnston said about Smith. At GCA Johnston started learning more rigorously how to understand the real physicality of the three dimensional object, how it moves in space, and how to model form. Copying masterpieces was just one aspect of his training, requiring much awareness. They would add small balls of clay at a fast pace, occasionally pausing to make a quick measurement. The level of concentration and quiet energy in the studio was thick and invigorating. Johnston and Collins looked as if they were wrestling with each other in a friendly match, but instead they were wresting with creating their own sculptures of the model’s head, as fast, as accurately, and as artfully as possible. “The works that I really respond to are the ones that I see as profoundly connecting to life, and that can be varied. … I am interested in looking for how to connect with nature, with people, whatever the subject may be,” he said. “Art ought to correlate to life, or somehow reflect or deeply relate to life. There has to be some aspect of some moral quotient because I think you have to try, on some level, to be a good person and therefore that extends to fine art,” he added. Johnston expressed his nostalgia for the past, but then pointed out that it’s consistent with the tradition. “I think Michelangelo went through the same thing. The majority of what he made was nostalgic for Antique Statuary. And in the 19th century Ingres was enormously nostalgic for Greek and Roman statues. He ran the French Academy in Rome for a while, and I think it’s a little bit the same with us, too—nostalgia for the old masters. But we are even further away in time, and now it’s even revelatory to be able to represent life. I love it,” he said as his eyes sparkled. Brendan Johnston’s current work will be included in a group show at Eleventh Street Arts in Long Island City, on April 15 to June 3.